A double-bill of sci-fi horror. 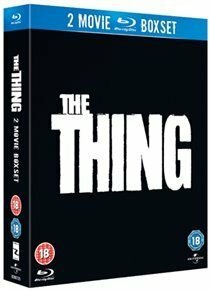 In John Carpenter's 'The Thing' (1982), a research team in the Antarctic, led by R.J. MacReady (Kurt Russell), discovers a spaceship buried beneath the ice, and becomes terrorised by the shape-changing monster that is housed within. In the 2011 prequel, the action is set on a research site in Antarctica three days before the action of the original story, the film focusing on the Norwegian camps that were the initial target of the alien invasion. When they discover an alien spacecraft on the site, science graduate Kate Lloyd (Mary Elizabeth Winstead) and experienced researcher Dr Sander Halvorson (Ulrich Thomsen) disagree about how to act. When Dr Halvorson refuses to abandon his research, Kate teams up with tough Vietnam veteran Sam Carter (Joel Edgerton) to pursue the alien intruders by helicopter.